The Artful Maven: A Heart That Pops??? 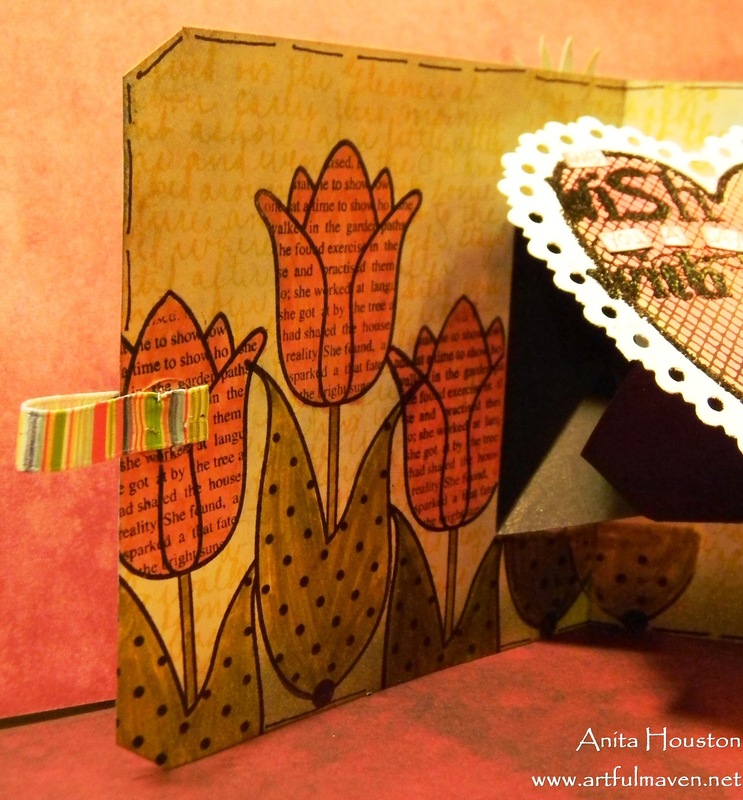 I have wanted to do a pop up card for some time (Been very intimidated to try it. 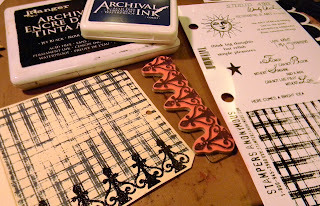 ), and I have yet to do one, until the challenge at the Everything Wendy Vecchi Yahoo Group has prompted me to get going on that. Our mission, (Should we choose to except it!) was to make a Pop N Cuts something or another, with a heart, some glitter, and some Wendy stamps. 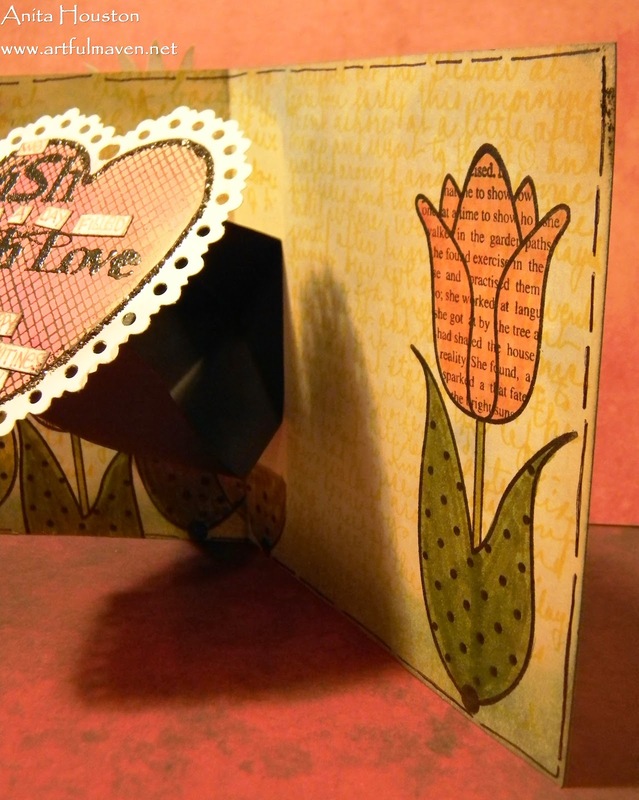 I think I took care of it all on this card for my extra wonderful In-Laws for Valentine's Day, except that I didn't have a Pop N Cuts anything, so instead I used a Sizzix Pop Up Spinning 3D Platform. 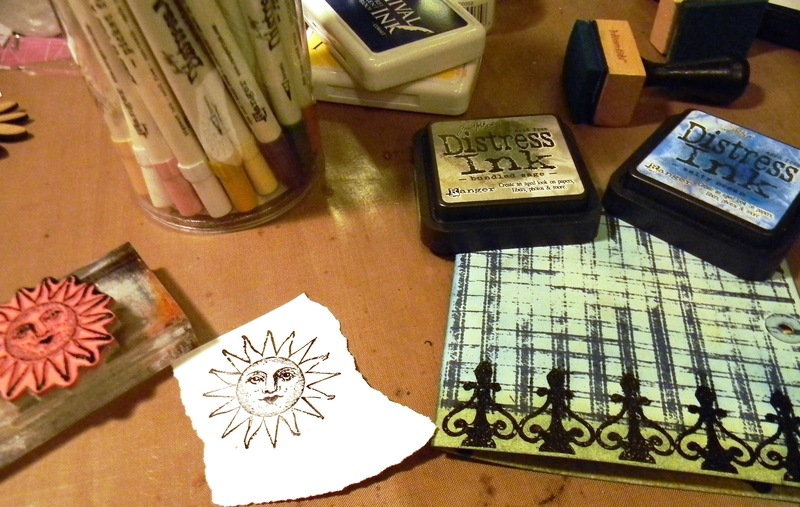 I have to say, I totally love this new stamp set of Wendy's "Sunshine and Art"...the sun especially! He is grown up and not cutsie. I'm totally loving the Plaid design as well. I stamped the Plaid in Cobalt Archival and the Gate Scroll in Jet Black and embossed it on the giant #12 tag from Ranger after I folded it in half to form a card. I inked the sky portion with Salty Ocean Distress and the bottom with Cut Grass. I stamped the Sun in Jet Black onto Specialty Stamping Paper, cut it out, and colored it in using every shade of golden toned Distress Markers I have. I adhered that onto the card. I stamped a Floral Art Part with it's coordinating Floral image, colored it in with Distress Markers, and blinged it up using Stickles. It too went on the front of the card. 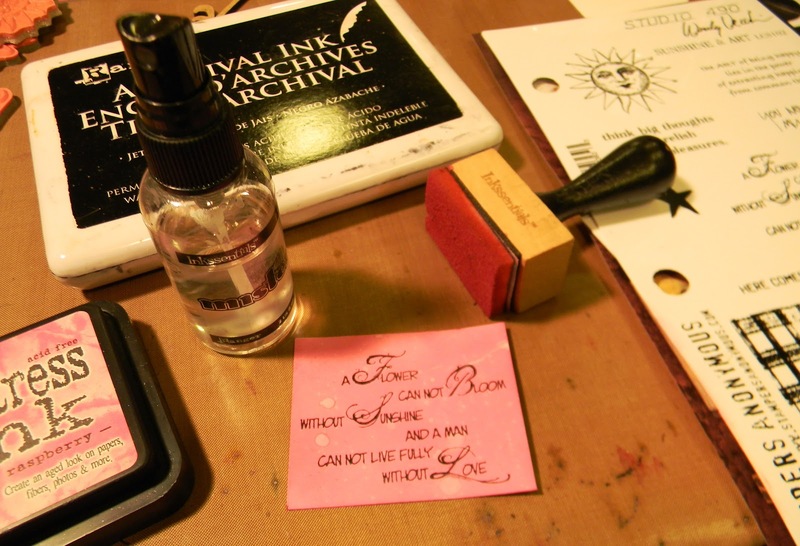 I stamped the sentiment onto Specialty Stamping Paper, dried it, and inked it using Picked Raspberry Distress Ink, then flicked some water on it. I dried it, and then sewed around the edges. I adhered this to the front of the card. I inked all the edges in Walnut Stain. 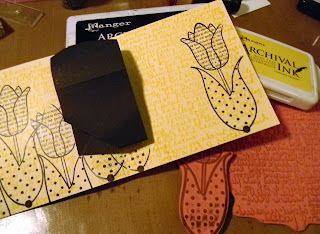 For the inside of the card I stamped the Script image in Yellow Chrome Archival, then I stamped the Tulips in Jet Black. I die cut the Spinning 3D Base using a scrap piece of black cardstock and folded and adhered it as per the directions. It took a few tries, and you should probably watch a video rather than listen to me, because I flunked Origami 101! I colored in my Tulips with Distress Markers, and added some color with the Summer Distress Inks to the sky and ground portions just like the front of the card. I made some dashed lines using a Glaze Pen around the edges for a border. I stamped the Heart in Jet Black onto Specialty Stamping Paper, dried it, and colored it in with both Picked Raspberry and a Spun Sugar Distress Marker. I love the blended look. I dried this, and then stamped and heat embossed in Black Powder and Jet Black Archival the works. I used a fancy cut out pair of scissors to cut out the heart, then used the Crop O Dile to punch holes to make a doily type pattern. I added the hand written and cut words.I adhered this to the Pop Up Base. I secured the ribbon using the Tiny Attacher to finish the card. 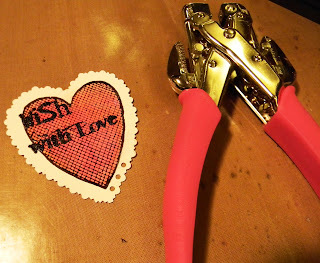 I am also submitting this card to Hels Sheridan's Sunday Stamper challenge of "Wish", since I'm sending some lovely Valentine wishes here. This is Fab - U - Lous! GREAT job on the pop up part, and love all the Studio 490 stamps...Thanks for joining the MAC, good to see you again! Not that you've been busy or anything...lol.. Pretty valentine. Love your choice of colors. Great job! Beautiful! The heart looks great. Beautiful! Love the way you did the flowers on the inside. Wonderful card Anita. I love every detail. Great how you made your own pop up card that's wonderful!!!! How gorgeous is this Anita, I just love the WV style you have created. A great card. Oh, but this is so cheery! I love all your stamping, and it all just flows together beautifully. The sun is very handsome against that lovely plaid background, and your posy is definitely perky. I love your field of tulips, and the pop up is very cool. I've never done one...don't have any pop up dies, but I think they are very clever. Just makes me happy to look at it! Fantastic pop-up - the plaid is fab, and the flowers either side of the heart are to die for - gorgeous! This is wonderful, great stamping. The front is gorgeous, love the sentiment, and inside is so pretty. I don't usually go for pop ups, and don't have any dies for this but I'm loving the depth of this. Your doily effect looks great on the heart too, very clever. Such a pretty Valentine! Awesome heart inside, and all the stamps are fabulous. I am drooling over the tulips and that fun sun! The lucky recipient will just love it and it will make them feel happy for sure! Anita, I love your blog and have been following it for a while. One question - I've been trying to find one of the florist "frogs" like you use to hold your cards when you photograph them. Any idea where I can get one???? Thanks! 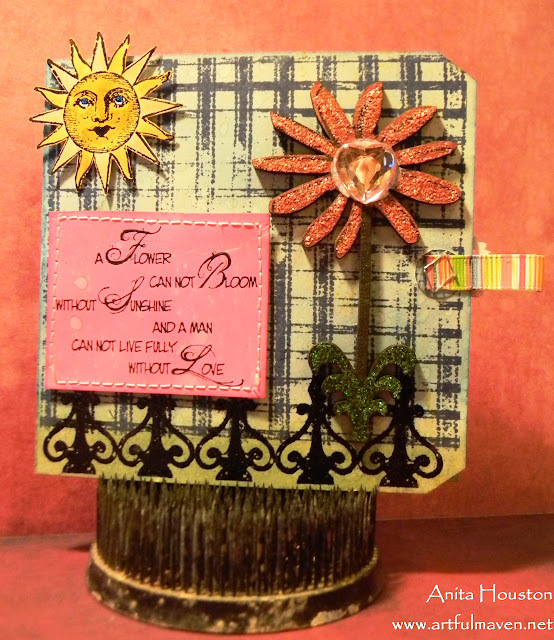 Fabulous popping heart, Anita! So much interest inside and outside! Love those flowers! Hugs! Wow, that's really a wonderful creation, so many details and texture. Gorgeous. So pretty, Anita! I love the flowers and pop up heart. 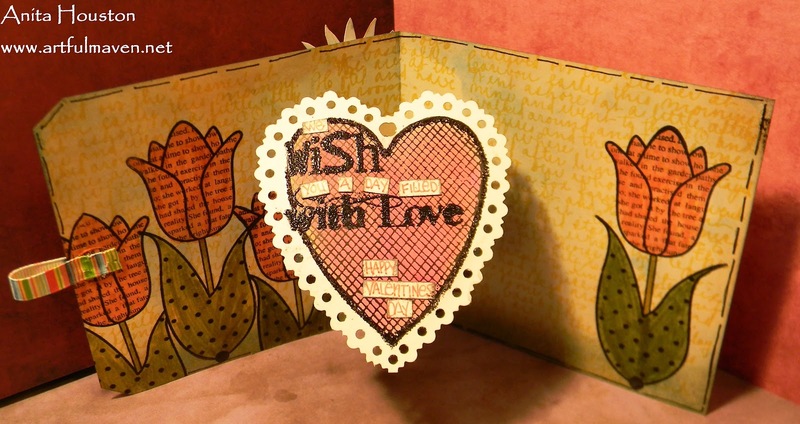 Love that Wendy Vecchi goodness! Great card with the pop up heart. Love those tulips - very springlike!! Superb and such a great combination of all the stamps. love the pop out heart! Way to work those Distress Markers! This card is so cool. I'm lovin' those stamps. The sun is very cool as are the tulips. I've never done a pop-up card but you have made it look achievable :) Your version is fabulous. 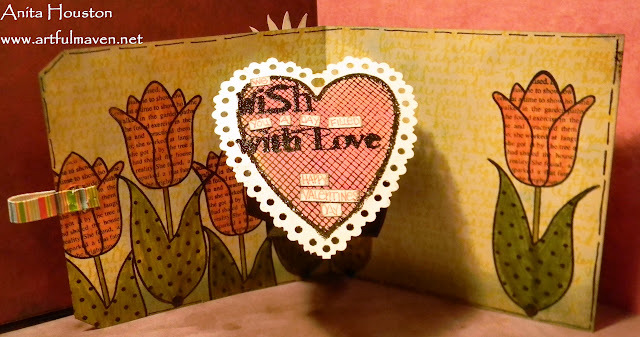 So fun to make the card from a giant tag. Hello Simon Says Stamp and Show! CHA - It's Also About The Goods! CHA - It's About The People!